Struggling to find that perfect gift for the essential lover in your life? Look no further. I’ve scoured the internet for the best gifts for essential oil lovers. And as an essential oil lover myself I think I’ve done a pretty good job. Diffuser necklaces are awesome. They enable you to diffuse your oils everywhere you go. All you have to do is add a few drops of essential oil to the necklace and you can inhale the diffused scent all day long! I love this diffuser necklace! You can choose from a leather piece or a terracotta piece to put inside your locket to absorb your essential oils. It hangs from a stainless steel rolo chain. You can also have it personalized with a name! Click here to learn more. I really love this diffuser necklace as well! This simple necklace is lightweight and versatile and perfect for layering. All you have to do is place a drop of essential oil directly onto the stone and it will naturally diffuse your oils. Learn more about it here! Many essential oil lovers like to take oils with them wherever they go. An essential oil bag is a convenient way to carry your oils around with you. And also much safer than rolling around at the bottom of your purse. I own this bag and I love it. I carry my oils in it everywhere I go. It includes a padded insert to hold 4 roller bottles. The bag and insert are both lined with a thin fleece to protect your precious oils. It measures approximately 7″ x 5.5″. Click here to check it out! I think this bag would make an awesome gift as well. The bag holds up to 8 10ml rollers or 6 15ml bottles comfortably. It measures 7 11/16″ x 4 1/4″. I’m a sucker for floral patterns! This essential oil bag is definitely going on my Christmas list! This bag has one matching insert that comes with it. It holds 10ml roller bottles conveniently upright and easily accessible. Check it out here. There is so much to learn about essential oils. Essential oil books are a great way to become more educated about the amazing benefits and uses of essential oils. There are many books about essential oils. A few of my favorites are shown below. The Complete Book of Essential Oils and Aromatherapy by Valerie Ann Worwood contains over over 800 natural, nontoxic, and fragrant recipes to create health, beauty, and safe home and work environments. I personally own and love this book! The Oil + Glass Recipe book would also make an amazing gift. I personally own and love this one as well! It’s a beautiful book with gorgeous photos inside. It also contains tried and tested essential oil DIY recipes, oil education and safety tips, dilution ratios, step-by-step directions and suggested supplies. Etsy has so many coffee mugs available for essential oil lovers. It was hard choosing which ones to feature for this gift guide. But the two I liked the best are shown below. I think they would both make wonderful gifts. This yellow ceramic coffee mug is adorned with a fun essential oil quote, “OIL UP BUTTERCUP” in permanent white vinyl. I think it’s so cute. Click here to check it out! I have quite the collection of coffee mugs and I think I need to add this one to it. It’s so pretty! Click here to check it out! Obviously a gift guide for essential oil lovers wouldn’t be complete without essential oils. A few of my favorite beginner kits are below. I think they would make perfect gifts! This kit from Plant Therapy includes 7 single oils and 7 blends. It’s great for those just getting started with essential or those just needing to restock their supply. Check it out here! I love Eden’s Garden. This is one of my favorite kits. Check it out here! Every essential oil lover needs a place to store their oils. Preferably a pretty place where they can put their oils on display. I love this boho-rustic essential oil shelf. It can be hung on a wall or set on a surface. Click here to learn more about it! This shelf is perfect for storing essential oils. There are multiple finishes available as well. You can check them out here. The Oils of Ancient Scripture set contains 10 oils from the most significant plants, botanicals, materials, and resins in the Bible. It is sol exclusively by Young Living. Click here to check it out! You can click here to learn more about the essential oils of the Bible. A doormat is not your typical gift but that’s what makes it so great. Especially when it’s a super cute doormat like the two shown below! This one is almost too pretty to wipe your feet on. This essential oil-inspired doormat is hand painted and stain, rot, and mildew resistant. You can learn more about it here. Just in case you haven’t told the whole world about your passion for essential oils yet…now your doormat can do it for you! This one does a great job of doing just that. I love it! Click here to check it out! Essential oil diffusers are a must for every essential oil lover. Amazon has a great selection of essential oil diffusers. I actually have a few I purchased from Amazon. This one works great and it’s less than $20. You can buy it here! This one also works great and would make an amazing gift. Click here to check it out! 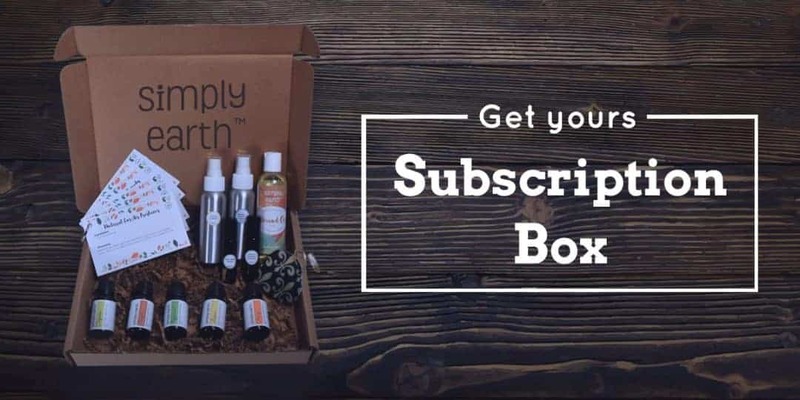 A Simply Earth Subscription box is the gift that keeps on giving. Each month that special someone will receive a wellness box full of everything they need to make 6 natural essential oil recipes. I hope you were able to find that perfect gift based on the suggestions above. These gifts are perfect for any special occasion. Which gifts for essential oil lovers do you plan on buying?